ThoughtWorks is a NFJS tour partner, and we wanted to use their radar as a straw poll of technologies in various markets we bring conferences too. Our first is St Louis. First some background. 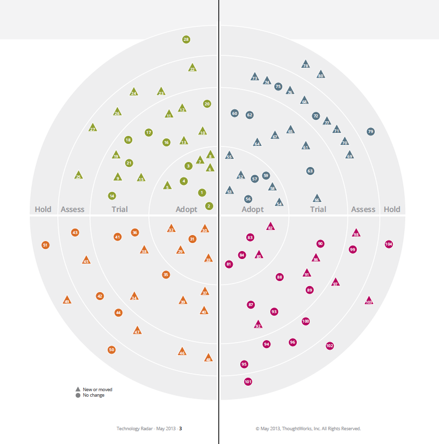 Neal Ford gives an excellent summary of the technology radar concept in his blog. Here’s a brief excerpt. Our St Louis Attendees had a lot to say about technologies that are reaching maturity and worth actively exploring. Indicating that the platform has some way to go yet before it’s ready for primetime.